« BUSHMEAT 11: Bonobo for dinner? What will it take to convince a Province that is larger than California – almost as large as Texas – and that has oil under its largest lake, gold in its eastern hills, diamonds in its northern rivers, iron under its forests and ivory still roaming around on four legs – that it is a priority to put effort into saving a corner of forest because of “exceptional” animals. 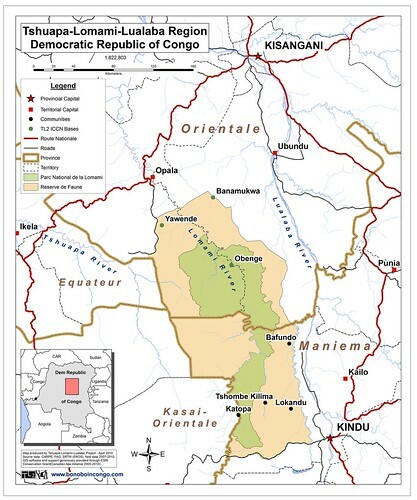 DRCongo’s largest Province is Orientale in the northeast. Lake Albert, its largest lake, lies on the border with Uganda. 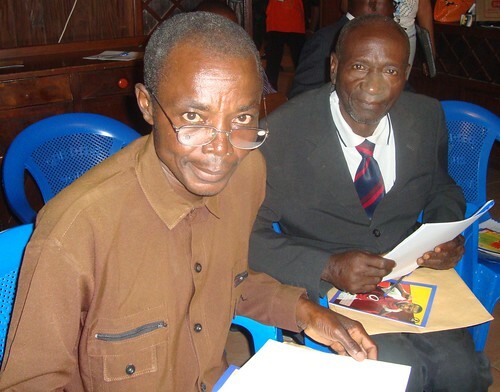 Maniema is the blue-green Province to the south. What if 70% of that Province’s population lives on less than a dollar a day. What if these Provincial distractions are further complicated by the fact that the Lord’s Resistance Army (LRA) is smashing, murdering and enslaving whole villages in the north, the undisciplined national army is responsible for elephant slaughter in the Province’s already existing national parks¹, Uganda is trying to get more than its share of the oil under the border lake, and national government agents are trying to grab up priority for informal taxation from the informal mining sector. Map of proposed protected area showing the giant’s capital, Kisangani, at the bend in the river. Alas, what if the British advise their tourists to avoid the Province because The Plague is still endemic there. It is the province where Ebola virus was first recognised (along with bordering southern Sudan). 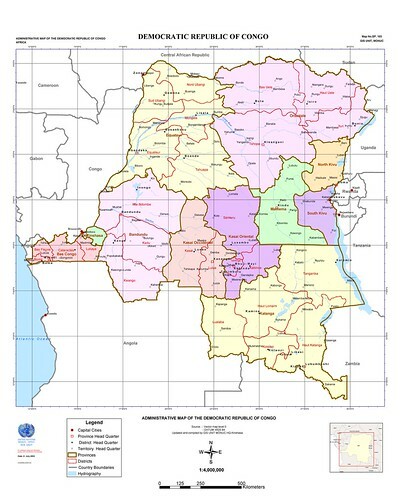 And one reputable theory is that AIDS had its origin right in the capital of this very province (yes, Kisangani, at the bend in the River, see map above). What if some of the top people in that provincial government really are not fond of conservationists at all because they are looking too closely at who owns and operates the “artisanal” logging concessions that are blooming all along the forest border and spreading rapidly into its interior. This complicated context made us hesitant to push our conservation efforts downriver from the relatively small province of Maniema (between the size of Mississippi and Louisiana), even though more than half of what we hope will become the Lomami National Park lies to the North. If the park is to become reality, Orientale Province has to concede its south-western corner (map above). We approached Orientale’s Provincial Minister of the Environment. We took him out to dinner and he chided us for having delayed so long in coming north. “Why is little Maniema ahead of the great Orientale”. A good beginning. The minister is center, in white shirt. Willy, TL2’s admin/finance director on my other side. Maurice, one of the field leaders squatting in front of me and Robert, from the local NGO SOS-Nature squatting in red-check shirt. 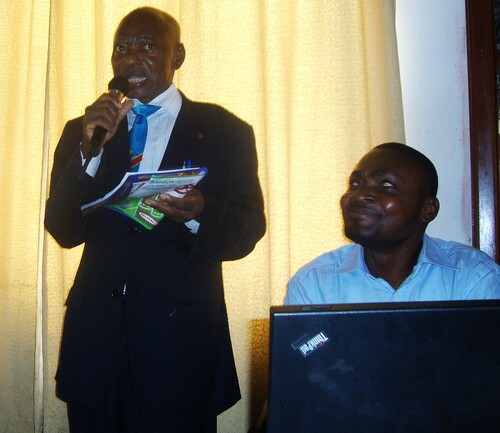 Our national sponsor, ICCN (Congolese Nature Conservation Service), assigned a very competent fellow to become the provincial director – a giant in his own right. Good support. I am on the higher step and still looking up. Paulin comes to this post from experience in two other parks of Oriental Province. 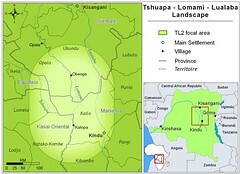 We planned a workshop in Orientale’s Provincial Capital at the bend in the Congo/Lualaba River (see map). We would explain how the forest along the Lomami is so important for Bonobo, the great ape found only on Congo River’s left bank. We would show pictures of the new species of monkey just discovered in these forests, and of the endemic Okapi and Congolese Peacock. The workshop went well. Although, at the very last minute the Governor and the Minister of the Environment were called off to Lake Albert to argue over oil. And the top General of the 9th military region – the one we think could put an end to military poaching of elephants – sent his second in command. But it was a success. Last minutes of preparation. Most the audience is seated. 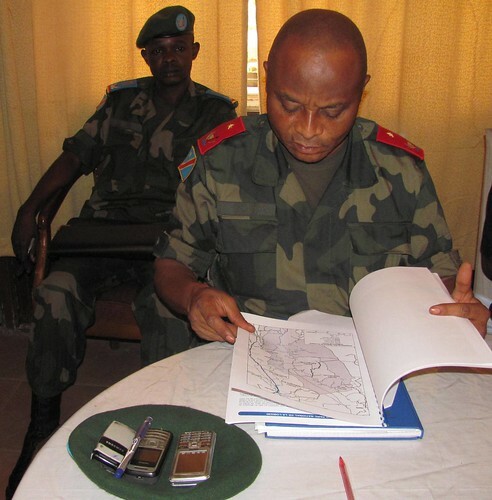 The second commander of Orientale’s Congolese military, FARDC, studies the brochure before the presentations. Two chiefs from the Ubundu Territory of Orientale Province. We had to call for more soft drinks. And at lunch we almost ran out of food. 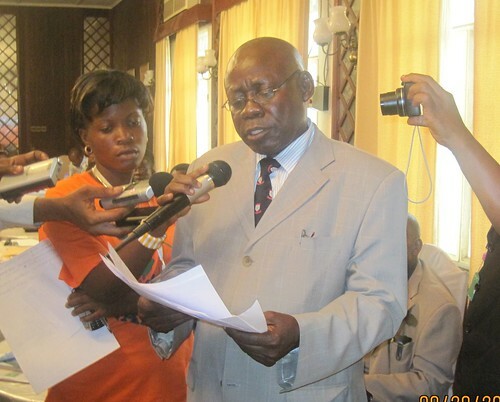 An influential national Senator native to the area said the park was great, BUT he wanted to see investment in alternative livelihoods (alternative to commercial bushmeat hunting). A challenge we have to try to meet! Senator Labama’s dry humor much appreciated by Willy — and all of us. 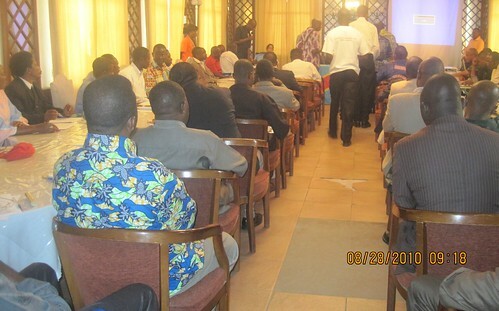 At the end, the media crowded round for the list of recommendations read by a local chief. The light is green. Continue to push for the park but continue to look into ways to help the surrounding population. Chief Kalibunji reads the final recommendations. We were exhausted after our first encounter with the giant. But ready for the next steps. ¹ More about elephant slaughter in the parks — unpublished, but in upcoming post. Congo Tourism. Focus on Lac Ndjale. 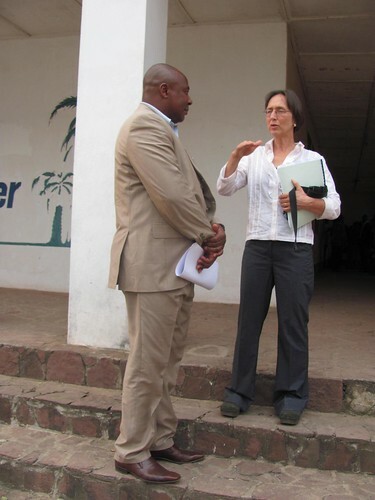 This entry was written by Terese Hart, posted on 2010-10-21 at 7:10 pm, filed under About the project, Kisangani. Bookmark the permalink. Follow any comments here with the RSS feed for this post. Post a comment or leave a trackback: Trackback URL. Congrats on achievements so far. 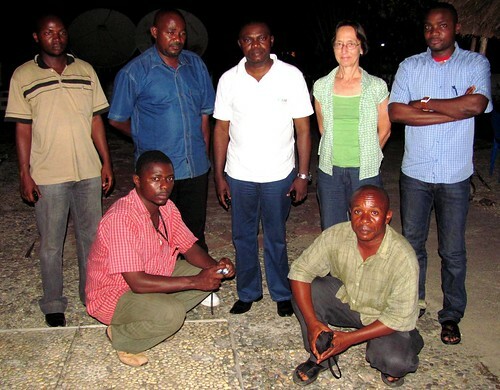 It is consoling to know there are people fighting to preserve natural forest and wild species in the Congo. Please get in touch with me and we can look toward possibly running this story (and maybe others) in Africa Geographic’s print and digital mediums.